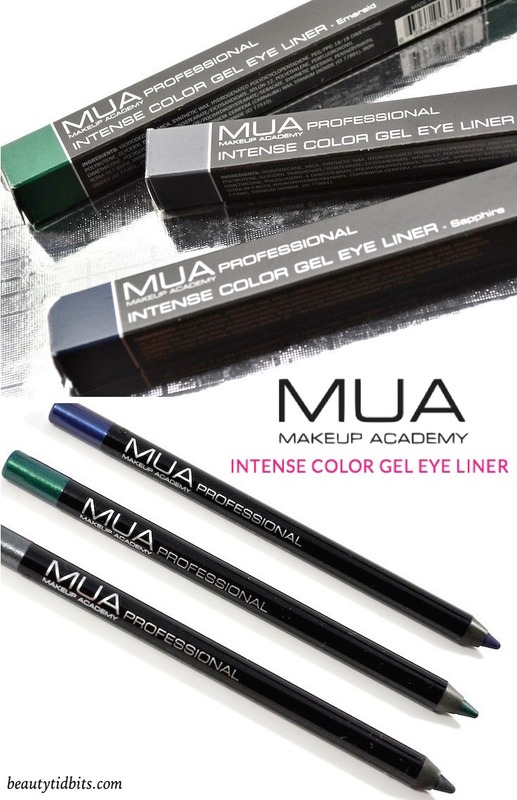 Press sample New from MUA Makeup Academy, the Intense Color Gel Eyeliners are long-wearing, waterproof liners that promise an intense color payoff with a velvety-soft glide-on formula that sets to prevent smudging and smearing. These are available in six shades: Aubergine, Chocolate Brown, Emerald, Gunmetal Metallic, Midnight Black and Sapphire. For those of you who may not be familiar with MUA, its a very popular UK brand known for its affordable & high quality makeup products. Their products are currently available exclusively in CVS and as far as I know the MUA products here in US are different than those available in the UK. The shades I tried are Emerald, Sapphire and Gunmetal metallic. Out of these three, my current favorite is the Emerald (green) that’s great for adding a subtle pop of color to your eyes! These eyeliners have a smooth and tug-free application with a creamy texture that glides on effortlessly. No tugging and pulling at all. The pigmentation is excellent with a slightly glossy finish and the colors can easily be built up for more intensity. You can easily smudge out the line for a smoky-sultry look and the formula gives you a good amount of play time to do so. Once set, the color lasts all day without any fading, migration or smudging. These pack staying power for sure! Even better? They have a pretty decent waterline wear as well at around five to six hours. Beautiful, rich, true color pigment. I love the iridescent finish of Emerald. It’s more subtle than a metallic liner but adds just the right amount of dimension. The Sapphire shade also offers fabulous color payoff. I love a good deep blue so I know this one is going to be a new favorite liner in my arsenal. And the shimmery gunmetal is vibrant without being too sparkly. These are a golden find! MUA Makeup Academy Intense Color Gel Eyeliners are available for purchase at CVS stores for $8 each. Make sure to check out if they have a BOGO sale going on, so you can grab these at a great discount! Is This The Best Drugstore Eyeliner For Waterline? Oh these look GOOD, awesome! How do you sharpen these? I have aubergine and love it, but it’s time to sharpen and I can’t figure it out! It looks like the bottom should twist, but it doesn’t. What am I not seeing?